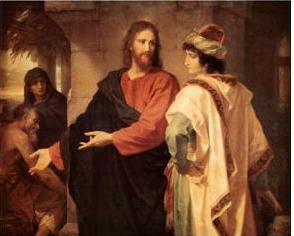 Jesus was walking along the road when a rich young man came running to Him. Jesus looked at the rich young man and He loved him. When the rich young man heard Jesus said that he has to give away all his money to the poor to follow Jesus, his countenance immediately becomes sad and he went away. Jesus said, “Anyone who had left his wife, brothers, or sisters, mother or father to follow Me and anyone who were persecuted and offended because of me will receive their reward in one hundred fold. The first will be the last and the last will be the first”. Jesus is telling us that if we put our spiritual live first, he will bless us. We should surrender all our wealth to Jesus and put Jesus first instead of money. There is nothing wrong with being rich but money holds us back from giving ourselves more to Jesus. There are Godly men in the Bible like Abraham, Isaac, Jacob and David that are very wealthy. We cannot focus ourselves to serve God when we put money first in our lives.